The fish forum needs some activity! A 14 year old female that weighed 80 pounds! She was heavy while the pic was taken so I let her rest on my knee until I realized I had to stand back up. Tough on someone who is retirement age!!!!!!! These fish grow very fast with the right fertility in the water. The first summer they will grow about an inch a week. 50 pounds in 10 years is not uncommon. All depends on the food supply. That is too cool! They are on my wish list of fish to see. Have the silver carp affected their populations? So wonderful to see the youngsters! Very cool! Those are great to see, Gary, especially a little one. Tamara and Bill, thanks for the comments. The little ones are cute for sure! Pete, not really sure if the wild population has been affected or not by the silver carp. We raise a lot of small fish like bluegill under the paddlefish but still if the zooplankton gets depleted you would think that would not be good. 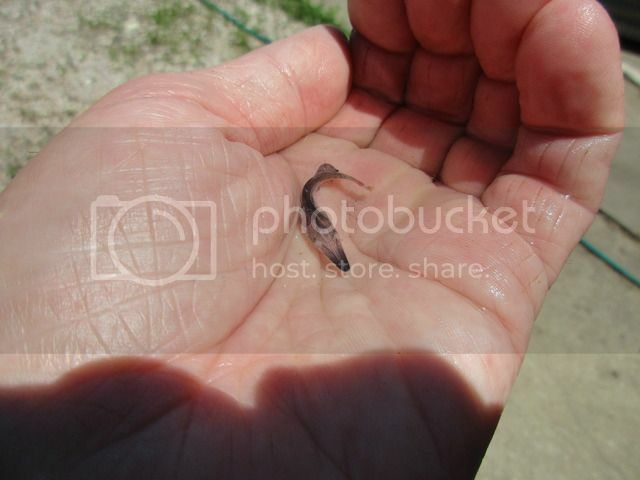 Just doesn't seem to matter that much if the fertility is high which usually is the case in ponds on a fish hatchery. I have to ask-do any of these cute little critters get sold to the public? I hear paddlefish obtained at a young age can be converted to feed and hjave a good chance of surviving in a backyard pond. They won't get as large as they will in the wild but a couple feet is possible. Joseph S. wrote: I have to ask-do any of these cute little critters get sold to the public? I hear paddlefish obtained at a young age can be converted to feed and hjave a good chance of surviving in a backyard pond. They won't get as large as they will in the wild but a couple feet is possible. Unfortunately they are only sold to Bass Pro, zoo's, and large city aquariums. Plus they are only available for a short time due to their rapid growth. Very interesting fish but difficult to keep healthy in even large aquariums. Plus it only takes one low oxygen night to cause problems in small ponds. I once raised one to 5 inches in a 20 gallon tank. What I learned was that if you miss one day of feeding the fish looked emaciated since it was actually 2 days between feeding. I fed that one zooplankton but they can easily be trained to eat pellets also. The company I worked for is Osage Catfisheries. They have a web site. Thanks Joseph for the comments, always like your posts and good luck herping! Thanks Gary! Kinda a pipe dream to have a pond with a few someday. I know Calacademy has one...hard to tell how successful they are with it it has quite a bit of rostral damage but I bet that is extremely common in aquariums for these. 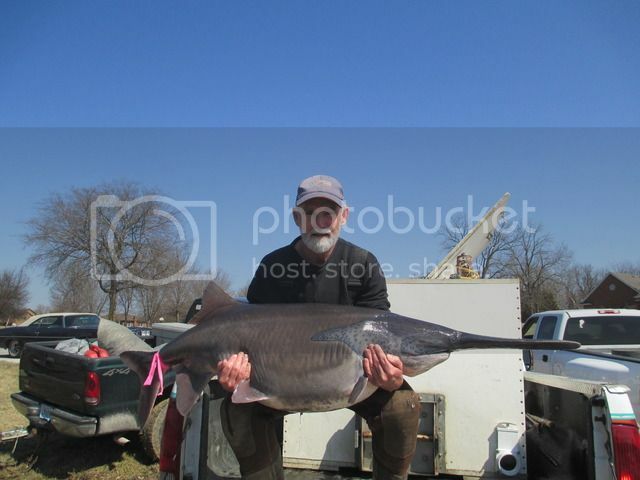 Shame the Chinese paddlefish is likely going down the tubes. 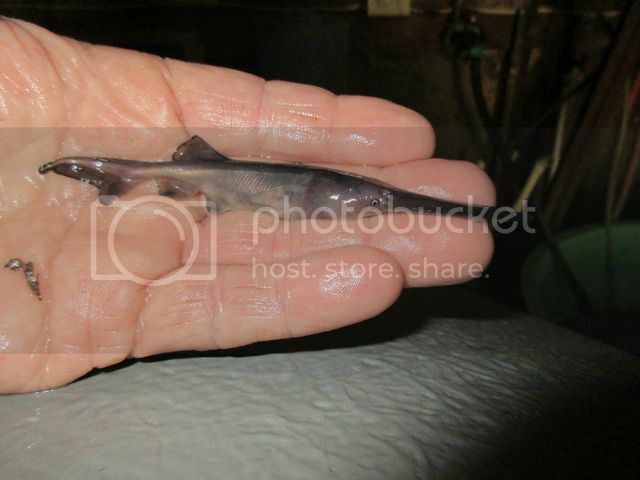 thanks for posting those paddlefish photos, they are quite a novelty to us living outside their range. I often hear of an apparently lawful snag fishery for them in the upper Missouri (?) river and elsewhere, and the eggs are sold for caviar. Have you tried it, and any comment? How about paddlefish to eat, are they palatable? They are so bizarre, but that does not preclude them being sought after as food. Sturgeon, another not so common species are among the best fish I have ever had. Do you get any returns (tagged) on your hatchery stocked paddlefish? Who is taking them, commercial or sport interests or both? Are they caught exclusively by snagging? Wow Vic that's a lot of questions! But seriously they really are fantastic fish. There is a snagging season but most of the caviar comes from commercial fishermen who gillnet them. They are nets with a 5 or 6 inch mesh. The net is set and the fish just swim into them and get caught. Laws are strict concerning caviar and several groups have been busted over the years. Amazing what DNA has done to help prosecute the bad guys! The taste of caviar is very salty and with sort of a buttery like taste to me. Aquired taste for sure. As far as the flesh it is OK but not great. We tag very few fish anymore since they are all stocked in our own ponds and private lakes. They usually are stocked as fingerlings about 15 or so inches. At that size the return is good except for the occasional otter but sometimes the reurn is almost 100%. After 8 to 10 years they are then harvested. It takes that long to become mature. And of course you only get half back that are female. They are gill netted very easily. A 20 acre lake can be done in as little as a couple hours. They are a mid water fish and never stop swimming and that is why the illegal taking of them is so easy. Not sure what the future holds for paddlefish. The state of Missouri releases several thousand each year which has to help. Eggs of wild paddlefish were not found until the early 60's so I have often wondered what the real population was say a hundred years ago.